Often called "wear and tear" arthritis, osteoarthritis (OA) is the most common form of arthritis in the U.S. In most cases, over time, cartilage in joints breaks down, and OA symptoms begin to occur. OA is most commonly found in the: Knees Hips Hands and fingers Spine Wrists, elbows, shoulders, and ankles can also be affected by OA, but this occurs less frequently. When OA is found in these joints, there may have been a history of injury or stress to that joint. Typically, OA comes on slowly. For many, the first signs are joints that ache after physical work or exercise. As the disease progresses, other most common symptoms include: Pain in a joint Swelling or tenderness in one or more joints Stiffness after periods of inactivity, such as sleeping or sitting Flare-ups of pain and inflammation after use of the affected joint Crunching feeling or sound of bone rubbing on bone (called crepitus) when the joint is used If you are experiencing any of these symptoms, it's important to talk to your doctor to find out if you have OA. Because knees are primarily weight-bearing joints, they are very commonly affected by OA. If you have OA in your knees, you may feel that these joints are stiff, swollen, and painful, making it hard to walk, climb, and get in and out of chairs and bathtubs. OA in the hip can cause pain, stiffness, and severe disability. Hips both support the weight of the body and enable movement of your lower body. When you have OA in your hips, you may also feel the pain in your groin, inner thigh, or knees. OA in the hip can lead to difficulty moving, bending, and walking. When OA occurs in hands and fingers, the base of the thumb joint is commonly affected and people experience stiffness, numbness, and aching. Other symptoms of hand and finger OA include: Heberden's nodes: small bony knobs that appear on the end joints of fingers Bouchards's nodes: small bony knobs that appear on the middle joints of fingers. 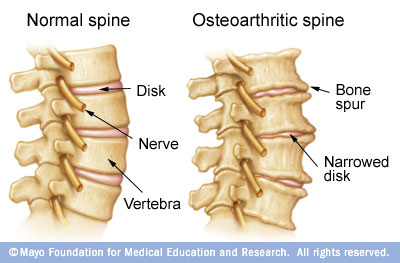 If you have OA of the spine, you may experience stiffness and pain in the neck or in the lower back. Sometimes arthritis-related changes in the spine can put pressure on the nerves, causing weakness or numbness in your arms or legs. What causes osteoarthritis? While the exact cause of OA is unknown, joint damage can be due to repetitive movement (also known as "wear and tear"). It can also begin as the result of an injury. Either way, with OA there's erosion of the cartilage, the part of the joint that covers the ends of the bones. Cartilage acts as a shock absorber, allowing the joint to move smoothly. As cartilage breaks down, the ends of the bones thicken and the joint may lose its normal shape. With further cartilage breakdown, the ends of the bones may begin to rub together, causing pain. In addition, damaged joint tissue can cause the release of certain substances called prostaglandins, which can also contribute to the pain and swelling characteristic of the disease. Injury to a joint increases your risk of developing OA in that joint. Joints that are used repeatedly in certain jobs may be more likely to develop OA because of injury or overuse. Sports injuries and auto injuries may also lead to the onset of OA. The chances of getting OA generally increase with the amount of weight the bodys joints have to bear. The knee is particularly affected because it is a major weight-bearing joint. People with joints that dont move or fit together correctly, like bowlegs, dislocated hips, or double-jointedness, are more likely to develop OA in those joints. Heredity An inherited defect in one of the genes responsible for manufacturing cartilage may be a contributing factor in developing OA. Dr. Breines give you a physical examination to check your general health, and examine the joints that are bothering you. You may also need other tests to help confirm the diagnosis of OA and determine the extent and severity of joint damage. X-rays can help determine whether you have OA or rheumatoid arthritis (RA). A series of X-rays obtained over time can show how fast joint damage is progressing. X-rays of the affected joints can show cartilage loss, bone damage, and extra bone growth (known as bone spurs) that can develop on the surface of normal bones. Treatment for arthritis is aimed at reducing joint inflammation, swelling and maintaining joint mobility. Dr. Breines uses a number of therapies in addition to stretching , gentle manipulation and specific exercises. He will also give you advice and information and the best way to prevent worsening of your condition.